When Ben Sheets is on the mound he’s been fantastic. The problem over his career has been keeping him healthy enough to be on the mound. Although he has missed time, the number of games has gone up each of the past three seasons. In 2006 he appeared in only 17 games, 2007 he found the mound in 24 games and a career high 31 times in 2008. So while the trend has gone up, the lingering worry still hangs over his head. Just ask the Brewers and their fans. Although when Sheets is on the mound he’s a true ace. 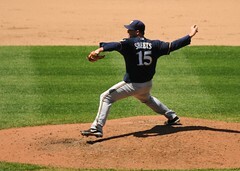 Sheets has a 3/4 arm slot delivery which produces an impressive fastball. The fastball sits in the low to mid-90’s with great life both up and down in the strike zone. Sheets also has the ability to locate his fastball consistently on both sides of the plate and even can add a little cut motion to it. The former Brewer also possess a huge plus-power curveball with a fantastic downward drop and a changeup with solid fading action which he disguises well with an arm speed similar to his fastball. As you can see when Sheets is on and healthy he can be one of the best pitchers in the game. Sheets is also a great competitor and wants to win with everything he has. This makes him a great addition to any club. I’ve always enjoyed watching the righthander on the mound and I highly suggest trying to find an archived game somewhere on MLB.com or iTunes and checking him out. Thome Slugging in Target Field? Jim Thome has been the biggest Twin killer of them all over the past decade (Keith Allison/Flickr). I’ve seen numerous reports this afternoon popping up around the Internet that the Minnesota Twins may be close to signing the veteran slugger Jim Thome. Not only would this type of a signing be uncharacteristic of the normally frugal Twins, but it would also make a very left handed heavy lineup even heavier. The Twins currently have an abundance of lefties including Denard Span, Joe Mauer, Justin Morneau and Justin Kubel in their starting lineup. It’s unclear whether Thome would slide into their DH role (which would surely bump Delmon Young to the bench) or if he would simply play a major role off their bench. The Twins have most likely jumped in on Thome due to the declining dollar amounts in the free agent market and possibly the fact that Thome has been a Twin killer over the years. In only 662 career at-bats against the Twins, Thome has posted a .311/.410/.628 line with 57 HR and 142 RBI. Now that’s a vicious thrashing he’s given them over the years. The bottom line is as a lifetime die hard Twins fan, a Jim Thome signing would shock me only to follow that up with a big smile. Blanton has been "Mr. 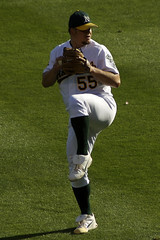 Consistency" during his stretch with the A's and Phillies (scot2342/Flickr). Diamond Cutter Spin: Well I can’t argue with this decision as the Phillies make a solid baseball decision by locking Joe Blanton (12-8, 4.05 ERA, 163 K in 31 starts) down for three more years. The nice thing about Blanton is that not only is he an innings eater (averaging 203.2 innings per year over past five years since becoming a starter) which the Phillies desperately need due to their weakened bullpen but he is also the model of consistency winning between 12-16 wins four of past five seasons with an ERA right around four. Blanton is the type of pitcher every club should clamor for. He’s as solid a number three guy in your rotation as you can ask for and has been healthy ever since becoming a starter with Oakland back in 2005. Plus this also solidifies their rotation for the next three seasons as their top four starters are all locked up through 2012. The Phillies are definitely the team to beat in the NL East once again in 2010. Is 2010 Clay Buchholz’s Year? Buchholz can handle the pressure of the big stage. So is 2010 finally the year that Clay Buchholz takes that big step towards super stardom? I feel funny asking that question of a guy who threw a no hitter in his second big league start. But then again, the way hyped-up prospects have a way of occasionally fizzling out, it may never happen. To me I don’t think this will be the case. I don’t see Clay Buchholz being another big name, sure-fire, can’t miss prospect that dwindles away into obscurity. Not this kid. I just see too much potential in him and too much talent in the that right arm for him to not make some sort of impact in baseball. 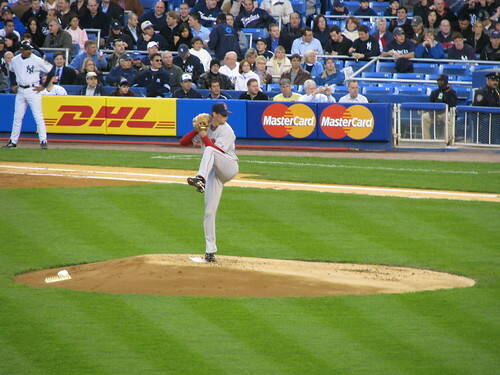 • Buchholz has a nice combination of a two and four-seam fastball that sit anywhere in the low to mid-90’s. His two-seamer has the better movement and can bust in on lefties while the four-seamer could use a little more movement on it to make it more effective. He also works his large arsenal of pitches off of his fastball very well thanks to the great movement on his secondary pitches. • Right off the bat Buchholz has a major weapon with this pitch due to the fact that he has one of the best change-ups in baseball. The pitch settles in right around 80 mph which he uses as one of his two out pitches and is almost unhittable when he is on with it. What makes it so hard to hit is that he disguises it so well with his normal delivery that it becomes very deceptive and keeps hitters off balance when expecting a fastball. • Almost as good as his change-up, Buchholz’s knee buckling curve freezes hitters in their tracks. It’s a hard breaking 12-to-6 overhand curveball that just drops right off the table. Like his change-up, he uses it as his out pitch (depending on which pitch is on that night) and will usually sit in the 76-81 mph range. With a solid fastball and one other out plus pitch, being a batter and worrying about a second out pitch can’t be easy. • As Buchholz’s fourth pitch, his slider comes in somewhere in the low to mid-80’s. Right now it is an above average pitch but shows the potential to be yet another plus pitch. As scary as that sounds, his slider has continued to improve over the past few years and isn’t far off from being yet another plus pitch to add to his bag of tricks. 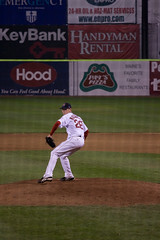 Buchholz has a wonderful delivery (hubertk/Flickr). • Buchholz’s delivery looks like you are watching an instant replay on a loop. He has a very repeatable motion after some great strides towards improving it over the course of the last couple of seasons. His delivery melds perfectly with his pitches as he’s able to throw his fastball and change from the same arm slot with the same motion to help make it that much more difficult to pick up. The only concern I have with his delivery is the high arm angle that he pitches with. It could be an issue down the road with injuries so it is something they will need to keep an eye on. • Just like his delivery, Buchholz is very much under control with his pitches. He has solid mechanics from the moment he starts his movement all the way until he releases the pitch. • Buchholz is built to be a big game pitcher for the blood thirsty Red Sox Nation. This kid does not rattle easily and has the presence on the mound to pitch in a very intense city like Boston. From what I’ve seen over the years is a young pitcher who is confident on the mound with some fantastic pitches at his disposal. Buchholz has a lot of pressure on him with big expectations from a very impatient fan base along with not a lot of room for learning on the job. The Red Sox need every win they can get in the ultra competitive AL East as well as a slew of veteran pitchers they bring in each year making it difficult for Buchholz to really feel comfortable. Coming into 2010 I expected Buchholz to be a big piece to the Red Sox rotation. But with the signing of John Lackey this may make it difficult for him to get a spot once again. I do believe that before the end of the year, we will have seen Buchholz get an extended period of time on the mound and he will have seen that young kid from 2007 show us why he is a big part of Boston’s future. And if you ask me that’s a pretty nice place to be. The history of stellar young pitchers developed through the Atlanta Braves organization is well documented. The Braves’ newest anointed future ace has already started his career off very strongly and looks to build on this success during his sophomore season. With Tommy Hanson the Braves are hoping this tall, lanky right hander turns out to be that future ace. Hanson has a plus-fastball with good movement in the mid-90’s, a solid change, and a “knee-buckling” curve that is one of the best in the game today to top things off. He has a very commanding presence on the mound which when coupled with the ability to throw all his pitches for strikes makes him very difficult to hit. 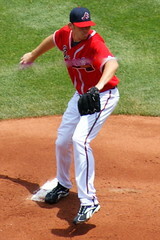 After finally getting the call last June, Hanson went on to dominate in his starts which helped give the Braves a late season surge towards the National League wild card. While the Braves fell short of the playoffs, they got a glimpse into what kind of an arm this young kid has and how well he fits into their future plans. As you can see, I believe Hanson will have a very successful sophomore campaign for the Braves. CHONE doesn’t see Hanson pitch quite as much this year whether that means they see him skipped in the rotation or shut down early. For me I don’t think Atlanta will even have the option to shut him down as he will emerge as their best pitcher and I believe they will be in the wild card hunt through September. He will be that big of an impact in Atlanta. The biggest deciding factor on Hanson’s success will be how he makes adjustments now that the league has seen him and will have even more exposure as the season goes on. This is such a telling time for a young pitcher as they learn how to adjust to the big leagues. Luckily for the Braves Hanson is a very smart pitcher. Byrd looks to solidify the Cubs' lineup (Keith Allison/Flickr). One of the most mind-boggling batting orders that I can ever remember is when the Chicago Cubs have decided to hit outfielder Alfonso Soriano in the leadoff spot. Just the idea of having a guy with a career .326 OBP (with a horrible .303 in 2009) atop your lineup in the spot you expect the guy to get on to set your table gives me fits. It just doesn’t make sense. Apparently Cubs manager Lou Piniella has had an epiphany over the winter as he has stated that Soriano will now hit in the sixth spot this upcoming season. Finally the world makes sense again. This comes on the heels of the Cubs signing another outfielder, free agent Marlon Byrd, who Piniella says will slide into the ever important five spot to backup Derrek Lee and Aramis Ramirez. This will be a major upgrade over Milton Bradley who spent most his time hitting fifth for the Cubs where he provided almost no protection at all for the middle of the order. I think this is a step in the right direction for the Cubs who are in some desperate need for all the help they can get in an improved National League Central. It’s not going to be an easy task for the Cubs to win the Central this season with the Cardinals locking down Matt Holliday last week and the Brewers solidifying their rotation with Randy Wolf. If the Cubs are going to succeed they are going to need help from everyone and need to avoid the injuries and internal implosion they experienced a year ago. The first step is getting some stability to their lineup and I believe this is a step in the right direction. Stubbs should win the starting CF job coming out of spring (Barbour/Flickr). The Cincinnati Reds are one of those teams that you can see beginning to boil. A team that you feel as if you can look down the railroad tracks and see a giant steam engine storming towards you. At least that’s how the rest of the National League Central should be feeling. Very similar to how we could see the Tampa Bay Rays beginning to form a few short years ago, the Reds too have been quietly assembling an army of incredible young talent. From a dominating starting rotation with Edison Volquez, Johnny Cueto and now Aroldis Chapman to a starting lineup full of great bats like Joey Votto, Jay Bruce and now Drew Stubbs. Stubbs is the guy the Reds hope can develop into a legitimate lead off hitter to set the table for Brandon Phillips, Votto and Bruce. While Stubbs is not a guy who projects to be a .300 type hitter, he has worked on his plate discipline to the point that he could draw enough walks to keep his OBP high enough to warrant the top of the order spot. Stubbs also has some pretty good gap-to-gap pop that can develop into home run power, especially in the home run friendly Great American Ballpark. All these things are great but what makes Stubbs so special is his game changing speed. This is why being able to get that OBP high is so critical for this club. Stubbs is a distraction on the base paths and has the 40-50 stolen base potential. This will only go higher the higher he can get that on-base percentage to climb. Stubbs can be a game changer. All three of us see him as essentially an everyday player. Bill James and I see him as more of an impact player this season than CHONE does in many areas. I believe that if he earns that everyday spot that manager Dusty Baker will allow him to run wild on the base paths. Chances are good he won’t start the season as the lead off hitter for the Reds, but he could very well see that change if he can get off to a hot start. Remember what I said, his OBP is key. And if it is between Stubbs and Willy Taveras (who had an embarrassing .275 OBP in 2009) to see who will play center and lead off, I don’t see too big of a struggle. You are currently browsing the The Diamond Cutter blog archives for January, 2010.